The new designs in AMP (which I believe stands for Airies Micro Plus, the same fabric used in Adventure Cycling Association jerseys). Fabric samples for the revived Old Guys kit from Voler, just in time for the Fourth of July. God bless America. This entry was posted on July 2, 2015 at 1:59 pm and is filed under Adventure Cyclist, Bidness, Jerseys. You can follow any responses to this entry through the RSS 2.0 feed. You can leave a response, or trackback from your own site. As long as they stretch, we should be good!! Happy 4th to all! Happy 4th to you and yours from me and mine. Even though I don’t wear a flag lapel pin like the best Patriots, I am very proud to be from a very great country. I’ve been to Lexington, Concord and Boston many times – it stirs your historical soul to see and feel what a passionate rag tag army can do. Hey, Russ … Voler has the art all ready to rock, so I think it’s just a matter of getting the online “store” up and running. They’ll send me a link once that’s ready for bidness, and I’ll post it in the sidebar, up top. Orders should take about seven bidness days from purchase to delivery. The Print On Demand program is apparently quite popular, and thus the Voler elves are working overtime. But it shouldn’t be much longer. The AMP is a nice lightweight fabric. I have an Adventure Cycling Association United States Bicycle Route System jersey that uses it, and v2.0 of the OGWGFIW kit used it, too. “Chris Christie”, the star of “all the kings men” has soon I saw this movie on TCM I thought thats Chris C.
The fabric needs to stretch in different directions compared to where it had to stretch when I bought my first Old Guys jersey, back in the nineteen nineties. Oh, yes, the old flag lapel….Happy 4th, everyone. I like that yellow color. Most, maybe all, of my Voler jerseys are AMP fabric. Wears well and is very comfortable. Thanks Patrick. Can we make fun of Fat Chris? Seriously Patrick? 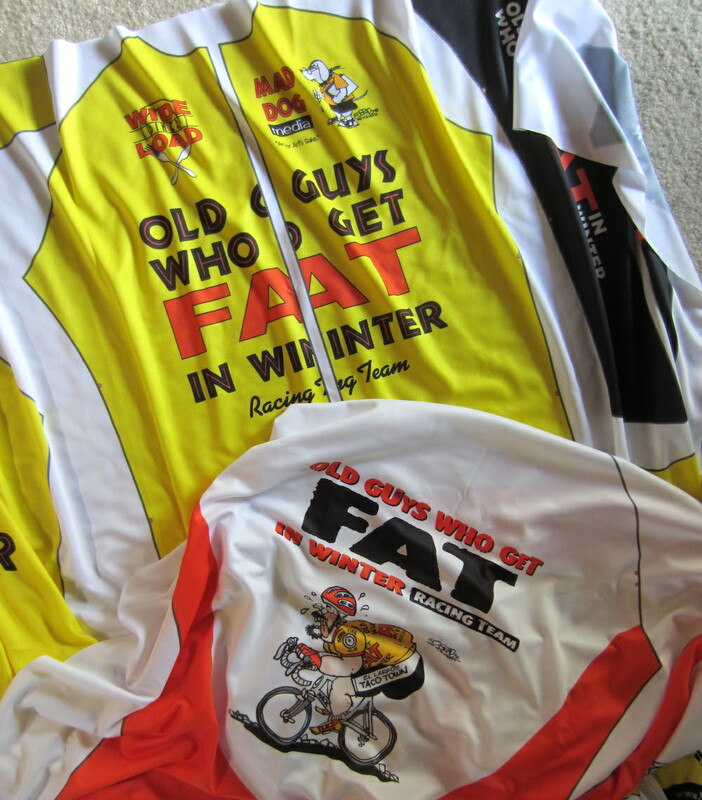 WHY would you put any white fabric on the original yellow fat guy jersey? It was perfect the way it was. White is only white once and then it looks like crap. Please reconsider and return to what was an already outstanding design!!!! I’m thinking that fabric and design sample has some white, but the jersey will be all yellow. It looks like the old design, plus a few tweaks that Patrick mentioned in an earlier post. John, the original design isn’t changing at all, from what I can see. That white you see will either get cut off before sewing, or get caught up in the seam. I’ve got both designs, Fat Guy I (yellow and black) and Fat Guy II (red with white background). The one with a lot of white is nice for the hot sunny days we get down here in the Land of Entrapment. But if you don’t like a jersey with spam/white in it…..
• The new version will have a full, hidden zipper (that’s the white stripe you see in the center, which will not be visible in the actual garment). • The black bands on the cuffs bear the URL for Live Update Guy (www.liveupdateguy.com). The second edition of the jersey also gets a full, hidden zip and a LUG logo on left breast and right rear pocket. What you see in the pic up top are two swatches of the AMP fabric with both designs laid out on them, not actual jerseys. Mea Culpa. That’s what I get for cruzin the inner webs after 64 miles and 4 beers. P.S. Would love to read your take on the Lynne Russell/Motel 6 incident. With the Jerseys, the LUGing, more work and life there probably isn’t time. There’s a little wobble in that story, isn’t there? First question I had was “Why are these high-rent folks staying in a shitbag motel?” I quit staying at Motel 666 years ago … hell, I’d rather sleep in the car, or under it. They were traveling with their dog and Motel 6 accepts dogs. A Dog Haus 🐕. That was the biggest (only?) reason. From reading the Huffington Post story, it sounds like the Motel 6 won out on account of their being tired and wanting a place to stay right now. The story states that the husband is a former “special forces officer”, meaning probably okay with dodgy accommodations, so “staying in a low-rent hotel” was probably trumped by “I’m tired” and “we don’t know the area” and “look, there’s a hotel”. Like how I worked in a reference to The Donald? Nyuk, nyuk. It’s a sign that no one yet is paying attention that The Donald is currently running second in Iowa in the polls, behind Scott Walker. Donald will choke to death on his sneaker before the primary is over. Just looking for some free TV time. He has his foot in his mouth so much he probably has gum fungus. Being second to Walker must really piss him off. Walker being a poor person and all.